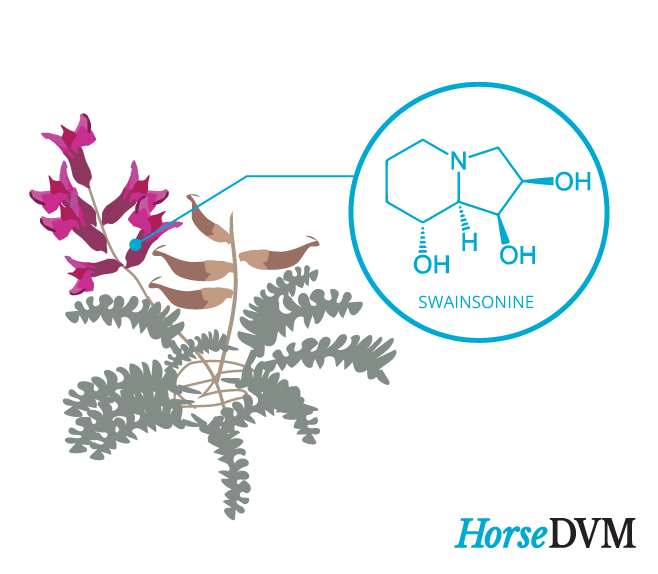 Locoism, also known as locoweed poisoning, is a neurological condition in horses caused by chronic consumption of locoweed plants. Locoweeds are perennial flowering plants that are considered to be one of the more serious poisonous weeds to livestock. There are 44 different types of locoweeds, many of which are most commonly found in grasslands and rangeland areas. There have been numerous cases of locoism in horses, sheep, and cattle throughout the World. Different types of locoweeds grow in different regions throughout the world. Locoweeds contain swainsonine, a type of indolizidine alkaloid that is toxic to horses and other animals if ingested over a long period of time. The chemical has a significant inhibitory effect on alpha-mannosidase in lysosomal and inhibits glycoprotein synthesis, resulting in lysosomal storage disease in affected horses. Horses with locoism develop neurological and behavioral disorders, as well as gait abnormalities causing abnormal posture, symmetrical ataxia, posterior limb peresis, emaciation, and difficulty standing. Clinical signs of locoism are observed after a few weeks to months of consuming locoweeds in contaminated pastures. Remove horses from the locoweed source This may alleviate some of the associated clinical signs, however in most cases the behavioral changes are usually permanent. Mood elevators Combinations of mood elevating medications such as tranylcypromine, protriptyline and reserpine might be beneficial. Attention should be placed on avoiding over grazing. Horses generally will not eat locoweed as part of their diet unless other forage isn't available. Removal from exposure to the plants can result in some alleviation of signs, however behavioural changes may be permanent. Locoweed Poisoning of Horses NM State University.